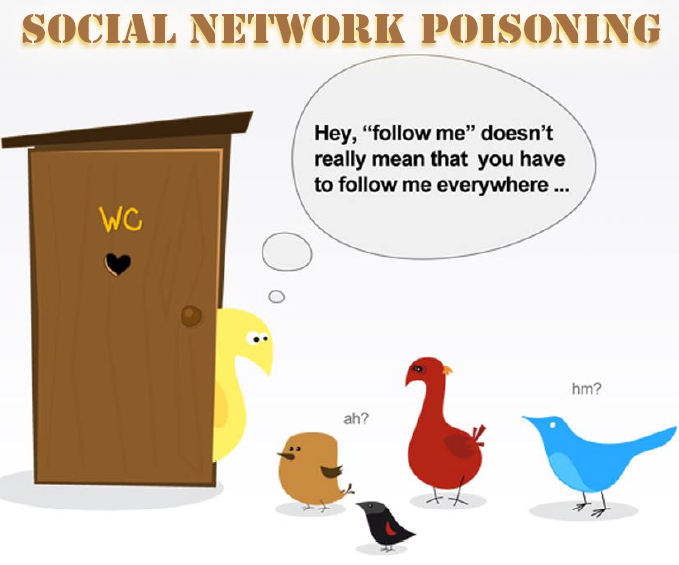 Social network poisoning - They are Following you Everywhere ! "Be Social" is the imperative of the last years. We live alternative lives, weave dense networks of relationships; we feel the irrepressible urge to be part of a group, to fill the void that we carry within. But this human propensity to aggregation is now the foundation of the concept of "social network", a community of people, each of them defined “node” by researches, which are united by friendship, kinship, passions, interests, religious beliefs. The whole world is represented by a lattice structure that scientists have long taken to study, to achieve the classification of that human "node", classify its customs, and especially to predict the behavior and through it influence the response of the community a particular event. The philosophy is that of the control. In May Pierluigi Paganini defined the term “Social network poisoning” writing before to Wikipedia EN and also to Italian Wiki. 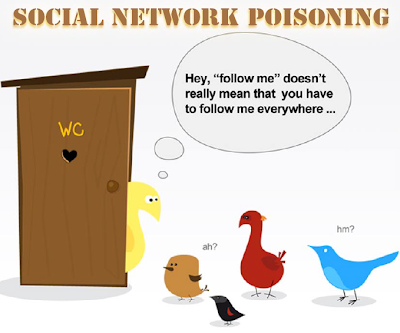 The term social network refers to the poisoning effect produced by the application of methods designed to make unreliable the knowledge related to a profile and its relationships. The application of this kind of attack on large-scale could lead to the collapse of Social Networking platforms affect its value for commercial purposes, as well as the utility in terms of knowledge and correlation of data provided by users, with a significant impact on its economic value. In the same way as the "route poisoning" (affecting the telecommunications network), the "poisoning action" are conducted with the aim to pollute the contents of this social network profiles typically introducing artifacts and relationships exist between them and real ones thus making the information unreliable. The result is the consequent failure of the chain of trust which are based on all social networks, in order not to allow search engines specifically developed to retrieve information of any kind relating to a particular profile. Replacement of identity, or the ability to impersonate another user to the wide variety of purposes intelligence social engineering. Simulation of identity, creating a false profile, which does not correspond to any existing person, for malicious purposes or simply to remain anonymous. Fuzzing profile, the voluntary introduction of elements false and / or non-matching to your profile to deceive intelligence systems, to prevent OSINT activities or other forms of personal gain. Fuzzing social graph, the association intended to groups and individuals that have nothing to do with their interests and relations with the intention of introducing "noise" in their social graph. Personal /social bots , creating a large number of fake profiles (e.g. millions of fake profiles) managed by machines, able to interact with real users in a way likely, thus changing the "sentiment" and "conversation "large-scale as well as altering all the social graph and to preclude meaningful correlations on the data. Black curation, the use of real users "holes" or fictitious to speak on topics of which you want to change the meaning, or to create new one ad-hoc, in analogy to the black SEO (search engine optimization) already use on search engines. How easy to understand the interest in social networks are the stars. Complex systems analyze information, scan faces and places, building new relationships and providing new information. Government agencies and companies have realized the full potential of the medium, a real gold mine in which the imperative is the power, information, and control of a at the expense of a user too distracted and inattentive to the dangers ahead. What to suggest to a friend node, be social, but sparingly. Be human first!